This is one of the most interesting pieces I've seen in a while! interesting composition. The head looks like an old carved piece of turquoise. Interesting color contrasts. wonderful effect - great work! fantastic collection of imagery. the central doll has so much presence! This is great, Jennifer! I really like the colors against the wood. The brightness of her clothes and the cracks in her face. Moving and hopeful. Yes she does look lonely, she has had a life, odd for such a young one. Beatiful artwork. I like your works! I have this feeling for old dolls too. The fishing lure, I like the fishing lure. Very nice touch. It is a very interesting picture and a great idea.. Wonderful capture, Jennifer! Have a good day! Ooooooooohhhh! Au Wei Ja ist das schön Böse! Coole idee in feinster Art und Weise und mit frischen, coolen Colors umgesetzt. Hut ab und Gratulation. Your world of expression is particular and far away from mine, but I like it ! Those dolls are meant to be found by you and "rejuvinated". Smiles across the miles. Lonely aNd lOvely wOrk!!! Love iT, Jennifer!!! Love it, love it!! Big hugs from Munich, have a wonderful weekend dear Jennifer!! molto bella e interessante! Complimenti!!! 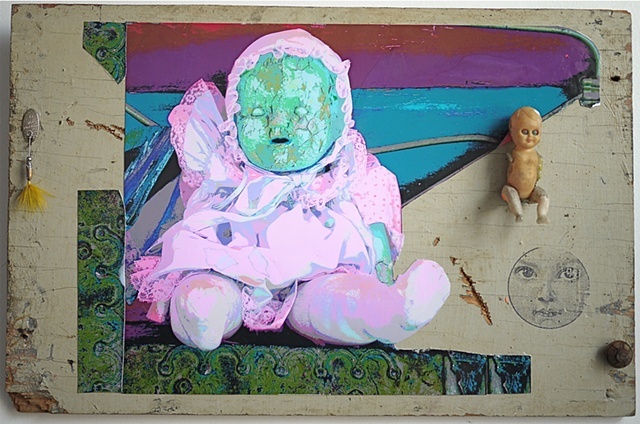 ove the rebirth of the doll in your collage! wonderful! Great piece! Colors are mesmerizing! This one draws me in. And I see I am not alone in this. Love that blue baby face! Hug across the Ocean!! Not the lonely! Than inner Smiled, my Dear Jennifer!! I love the story behind this but I hate to think of her lonely. Perhaps someone has taken her home by now .... I hope so. a wonderful blend of elements. I can feel the loneliness on the dolls crackling face. Excellent Jennifer, what a cute baby face in the photo. Yes, the old dolls are great models in Art, always !! Impressive art work , dear Jennifer ! Great piece and assemblage of the parts. The face in the circle could be that of the lonely doll in better times.